It was a gorgeous day today - about 80 degrees, sunny and dry. 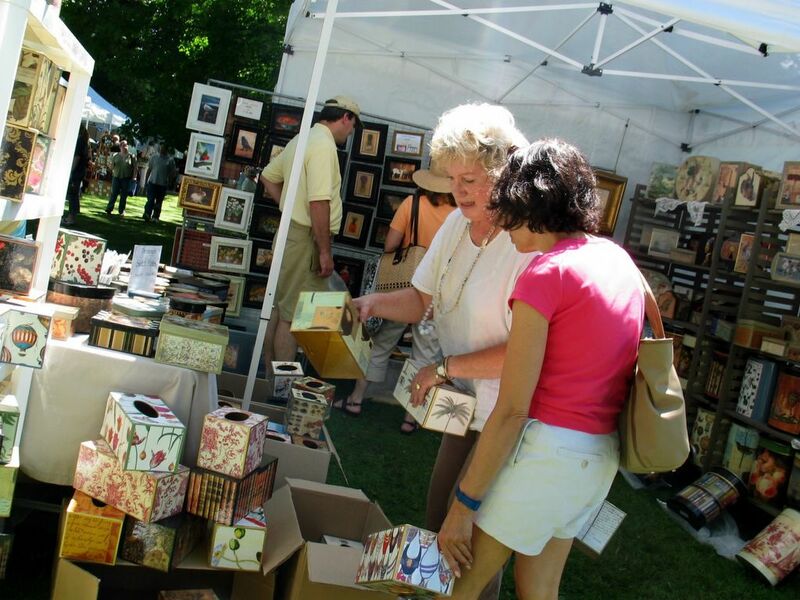 The perfect weather for the annual craft fair on the green. People sell handicrafts like these decoupage'd tissue boxes and picture frames; there were doll and children's clothes, cabinets, drawings and photography (maybe I'll have a booth next year!) LOT of jewelry, pottery, handbags, and lots of things to hang up on the wall and admire. I bought some earrings and got a few pictures I liked - here are the rest. It is quite interesting to see that although we all live in different parts of the world, we still enjoy the same things. Over here craft markets are also very popular and if I look at your photo's they sell the same kind of things than your's. Thank's for all your lovely shots every day, I enjoy them very much. 80 degrees!!! are you sure? Are you in some kind of barbecue? LOL, Nuno! That's Fahrenheit! In celsius, it's about 26.6. I like book fairs, I wanna buy all kind of books but I don't have time to read all of them. Thanx for coming to my blog. Thanx for your pics. ooh, martha stewart looking tissue boxes! wow - I don't even know where to being - this crafts fair has so many different things - the pics are awesome and gives a good sense of the day - the boy under the table was kewt- and that blacksmith wow - hows the give me your thumb and whoally - art! Nice how u did the photos! That Ed, now he's exporting our little games! Another day, another name. I just can't keep up with it. I'd just warmed to Muppet, now I've gotta get used to MARTHA??? Nuno's leading on Jen, it's midnight 30 here& my place is still heating up. It's my dream to wake up to an 26.6º, or even 26.9º day tomorrow. Instead, it's hotter than that tonight. How do the earrings look on the wall? We had the Tour de Portugal drugged-to the-silly-hats cyclists roar -well, crawl through the town & nobody was brave enough to stand the heat & cheer them through.